Welcome to The Carolina Apartments! DISCOVER THE BEST OF BOTH WORLDS! Comfortable & quiet living in The Hill Farms Neighborhood. Enjoy life in a peaceful park-like setting at The Carolina Apartments. You'll appreciate our excellent location which is conveniently situated on Madison's near west side, close to UW Madison, UW Hospitals, and Downtown. You are only 2 blocks from The Hilldale Shopping Mall where you'll find bookstores, a pharmacy, grocery and hardware stores plus shops for all your other necessities. You will also find banks, a post office, movie theater, restaurants, medical and dental offices. With our lovely grounds, well maintained buildings, and warm and professional staff, we strive to meet the needs of our residents. We provide a large outdoor heated swimming pool, mature & beautifully landscaped grounds, and picnic area for summer relaxation. Relax in our pool or read a book in the pavilion. Grill dinner on one of our gas grills and enjoy as you watch the sunset. Our beautiful apartment homes adjoin Rennebohmn Park, a large city park with tennis courts, playground equipment, open space to add variety to your outdoor enjoyment, or you can attend free outdoor concerts. Feel free to stop in during our office hours, no appointment needed, to look us over and see if we can meet your housing needs. Meet our staff, examine our apartments, and walk our grounds. A CLASSIC WAY OF LIFE! 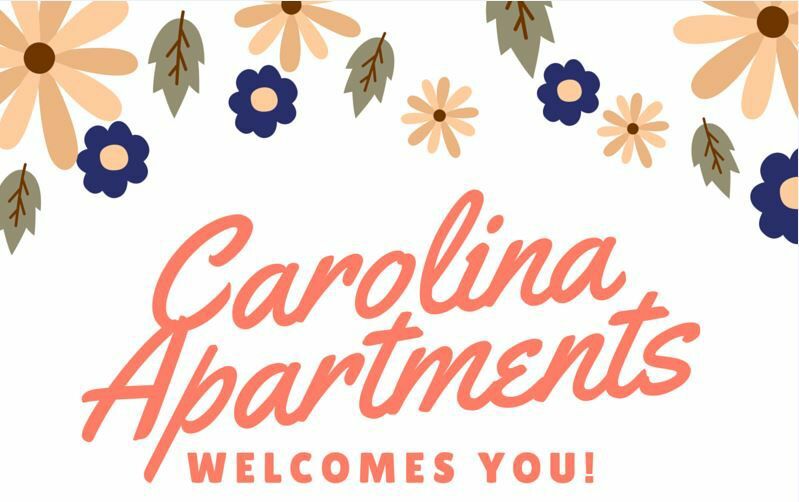 Find your new home at The Carolina Apartments!